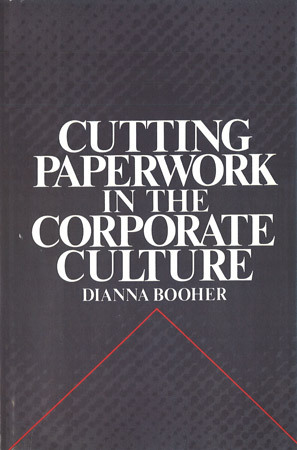 Every year, corporations waste millions of dollars on unnecessary paperwork. To the hard costs of lost productivity, administrative paperwork caused by burdensome record keeping and increased regulations, and the associated security to keep it out of the hands of thieves, we must add hard-to-calculate costs such as lost sales from paperwork delays, and the sapping of employee morale by the drudge of paperwork that now occupies 50-70 percent of all working hours. Fortunately, the “paper disease” is not incurable. In this important book, business communications expert Dianna Booher describes the causes of the malady and prescribes an all-encompassing cure for the epidemic. Before you write, ask yourself: Can I communicate this message orally? Encourage clear, to-the-point writing from employees. Foster a climate of trust that will eliminate the “cover-your-tail” email. Break the write-edit-write chain from person to person, department to department. Adopt a leadership style that encourages trust. Your communication culture may be the biggest asset on your balance sheet. This how-to guide provides answers to create that culture and reduce those costs.